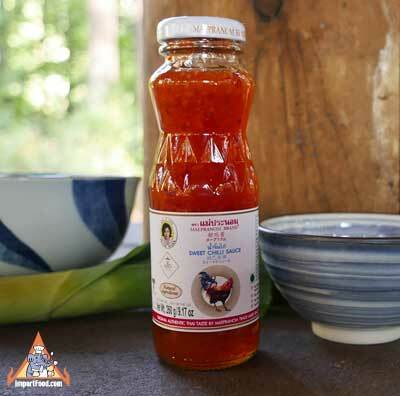 The most delicious sweet chilli sauce from Thailand. Mae Pranom is the true original brand known to all Thai people and offered in corner stores & sidewalk chefs throughout the country. Mae Pranom dipping sauce is more robust and has slightly higher chile heat than Mae Ploy brand (Mae Ploy brand is more familiar outside of Thailand due to marketing). Use it generously at home and take it on picnics. We love this sauce and highly recommend it. Packed in a beautiful glass bottle with attractive label, Mae Pranom is a large producer employing the highest quality standard. Ingredients: sugar 40%, red chile 20%, garlic 20%, vinegar 15%, salt 5%. No additives. Product of Thailand. Tod man pla is one of the most famous Thai dishes but seems to be rarely offered on the menus of Thai restaurants in the United States. We're happy to show you how to make it, step-by-step, with great results. Get a good fresh piece of fish to ensure success. Also see our Thai Street Vendor video below left, for detailed guidance.